The first planet outside our solar system to show signs of water has now shown signs of methane - the first organic molecule to be identified on an extra-solar planet. A UK/US team of astronomers, including UCL's Dr Giovanna Tinetti (UCL Physics & Astronomy and European Space Agency) made the discovery using data from the NASA/ESA Hubble Space Telescope. The results are reported in the 19 March 2008 issue of the journal 'Nature'. The scientists found the signature of the molecule methane in the atmosphere of a planet called HD 189733b, which is about the size of Jupiter and orbits a star 63 light years away. In May 2007, Dr Tinetti led a team that found signs of water on the same planet. Dr Tinetti holds a prestigious STFC Aurora Fellowship to study biosignatures on planets beyond the solar system. She said: "We haven't found life on another planet yet, but this in an exciting step towards showing that we can detect these signature molecules where they are present in the Universe." Under the right circumstances, methane can play a key role in prebiotic chemistry - the chemical reactions considered necessary to form life as we know it. Although methane has been detected on most of the planets in our Solar System, this is the first time any organic molecule has been detected on a world orbiting another star. This discovery proves that Hubble and upcoming space missions, such as the NASA/ESA/CSA James Webb Space Telescope, can detect organic molecules on planets around other stars by using spectroscopy, which splits light into its components to reveal the 'fingerprints' of various chemicals. The planet's star is very much like our own sun, although a little cooler. 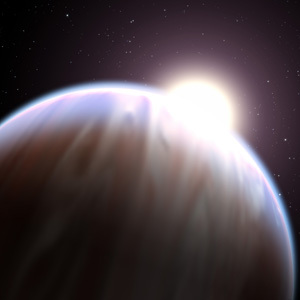 However, HD 189733b is a gas giant planet, about 15 per cent bigger than Jupiter and more than 30 times closer to its star than the Earth is to the Sun - explaining why its atmosphere swelters at 900 degrees C, meaning that crucially, it is unlikely to support life in such an inhospitable atmosphere. The observations were made as the planet passed in front of its parent star in what astronomers call a transit. As the light from the star passed briefly through the atmosphere along the edge of the planet, the gases in the atmosphere imprinted their unique signatures on the starlight. Dr Tinetti added: "Water alone could not explain all the spectral features observed. The additional contribution of methane is necessary to fit the Hubble data". Methane, composed by carbon and hydrogen, is one of the main components of natural gas, a petroleum product. On Earth, methane is produced by a variety of sources: natural sources such as termites, the oceans and wetland environments, but also from livestock and manmade sources like waste landfills and as a by-product of energy generation. Dr Tinetti is however quick to rule out any biological origin of the methane found on HD 189733b. "The planet's atmosphere is far too hot for even the hardiest life to survive - at least the kind of life we know from Earth. It's highly unlikely that cows could survive here!" "This type of hot planet should have much more carbon monoxide than methane but HD 189733b doesn't," explained Dr Tinetti. "A sensible explanation is that the Hubble observations were more sensitive to the dark night side of this planet where the atmosphere is slightly colder and the photochemical mechanisms responsible for methane destruction are less efficient than on the day side". Team leader Dr Mark Swain (NASA Jet Propulsion Laboratory) added: "This is a crucial stepping stone to eventually characterising prebiotic molecules on planets where life could exist".